One ingredient we’re starting to see on menus more and more frequently is black garlic. What is black garlic, exactly? With any trendy food comes the inevitable claims of Super Amazing Health Benefits (now with more Omega-3s! ), so take from it what you will that it’s meant to have double the amount of antioxidants of non-fermented garlic, and Oprah.com claims it’s a new superfood. But let’s get down to the good stuff – how does it taste and what do you do with it? First off, you can eat it raw if you’re so inclined. The flavour is incredibly mild and a touch sweet, almost like a firm textured roasted garlic but leaning towards a balsamic vinegar or tamarind tanginess. General guidance is to cook with it as you would use normal garlic – but beware, the inky colour does transfer so if you didn’t want grey ricotta or eggs you may wish to hold off. – Sautéed with shallots in an asparagus risotto. You can see I wasn’t kidding about the colour transfer thing – besides the garlic, the only ingredients in this dish are shallots, leeks, asparagus, arborio rice, white wine and clear vegetable stock. Now I get the hype – and it’s spot on! 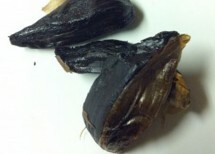 The flavour of black garlic was very rich and pronounced. In fact, I will say it added so much to the dish I didn’t need nearly the level of salt and parmesan I usually sneak into risotto. 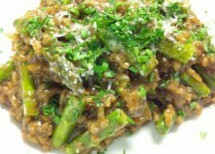 Asparagus risotto with black garlic and leek. It’s not the most common product to find so you may not be able to pick and choose when it comes to quality. If you’re going to make it yourself, it’s crucial to start with the highest quality garlic because the fermentation process intensifies flavours. I was advised to keep it in a paper bag if I would use it within a month, or in the fridge to keep for longer than that. So, how to find this magic ingredient? 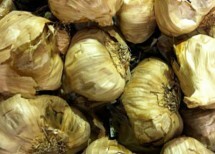 Though Korean in origin, it seems that there’s one commercial source of black garlic manufacturing and distributing across North America: blackgarlic.com. In Vancouver you can find it at both South China Seas Trading Co and Whole Foods Market (Cambie). Going to definitely try to find some black garlic. I had no idea there was such a thing! Oh my god, I love black garlic. So delicious just pooped out of its skin and spread on freshly baked bread – g’nom. I will have to actually try using it to cook with, it never lasts long enough! If you do want to try it at home, the proper temperatures should be 140F/60C (not 140C/280F which would probably leave you with nothing but garlic charcoal!). Most home ovens will not go that low…so a food dehydrator or (as I have done) a DIY chamber with a lightbuld as a source of heat will work fine. The most common type of asparagus is green, but you might see two others in supermarkets and restaurants: white, which is more delicate and difficult to harvest, and purple, which is smaller and fruitier in flavor. No matter the type you choose, asparagus is a tasty, versatile vegetable that can be cooked in myriad ways or enjoyed raw in salads. .,’. I’m very honored to send you this message. I’m from Henan Mushan Black Garlic Biology Engineering Co., Ltd .Black garlic is a new green and healthy food and made of specially selected fresh garlic by strictly scientific fermentation. As a pure natural and health food, it mainly contains amino acids, proteins, garlic-ene, active SOD and polyphenols and so on. During the Chinese president visited to the United States,black garlic appeared in the banquet.Due to its natural without any additives,it was soon recognized by people all over the world. Our slogan is “Let all those who love me and I love away from subhealth” and we welcome you to join us to bring healthness & happiness to people all over the world .